“It feels… I’m not going to say surreal. I did not expect it, but it’s a bit of the end of a journey with this film” Matthew McConaughey says to the press backstage with his distinct Texan accent and newly-acquired trophy in his hand. It’s funny that he mentions the word surreal because that might have been the reaction of someone who deep down was blindsided by the accolade, but it wasn’t that. He says it was unexpected but you get the feeling this recognition was part of a process by the 44-year-old that has been years in the making. You See, in the 2000s the man now garnering critical acclaim was somewhat of an expert in the less than award-worthy romantic comedy genre. Films like The Wedding Planner, How Lose a Guy in 10 Days, Ghosts Giffriends Past, and Surfer, made McConaughey a household name (and a rich man). But as each lovey-dovey outing was followed by another, you got idea the actor had resigned himself to taking the easy route: using his movie star looks and smooth-talking persona to carry him from one role to the next. But then something struck a chord and the man many had come to expect in the year’s biggest rom-coms was absent. If you look at the list of films he has starred in, there is a noticeable two-year gap after 2009s less-than-favourable Ghosts of Girlfriends Past. 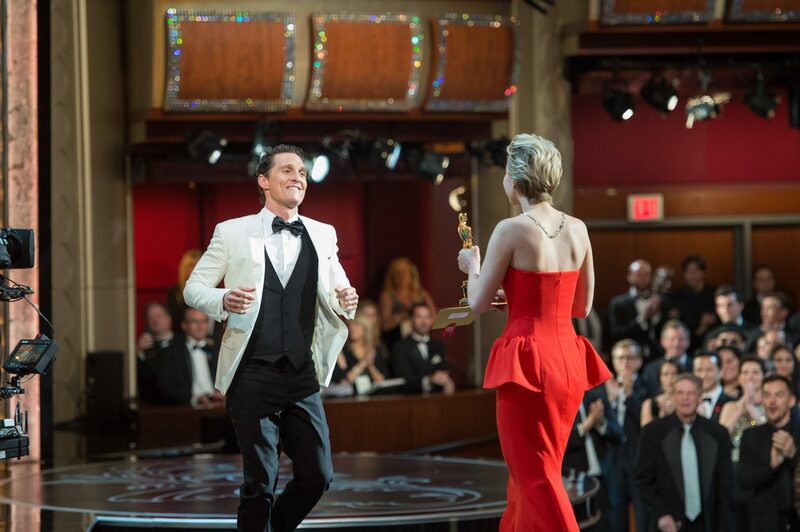 Matthew McConaughey accepts the Oscar® for Performance by an actor in a Leading role for his work in “Dallas Buyers Club” from Jennifer Lawrence during the live ABC Telecast of The Oscars® from the Dolby® Theatre in Hollywood, CA Sunday, March 2, 2014. It was a break that would see the southern Lothario guise replaced with a more serious front. Rumours were swirling that he turned down a $15 million deal to star in a 21st century remake of the much-adored 1980s TV series, Magnum PI. But the more he declined roles similar to what he had become famous for and stayed out of the spotlight a funny thing happened. McConaughey’s name started to get thrown around for vastly different characters than his perfected-to-a-tee fun-loving Casanova manifestation. career had undergone a period of revival and rebirth. When asked about what he thinks has been the key to this new chapter in his already-storied career, McConaughey reflects for a moment, thinking about the performances he has undertaken in the last four years, then the answer comes to him. life. As he fervently recounts, the script for Dallas Buyers Club got turned down 137 times over a 20-year span and while notable actors were temporarily attached to the project at different times they ultimately passed on it and so further down the list of leading men it went until it reached McConaughey. 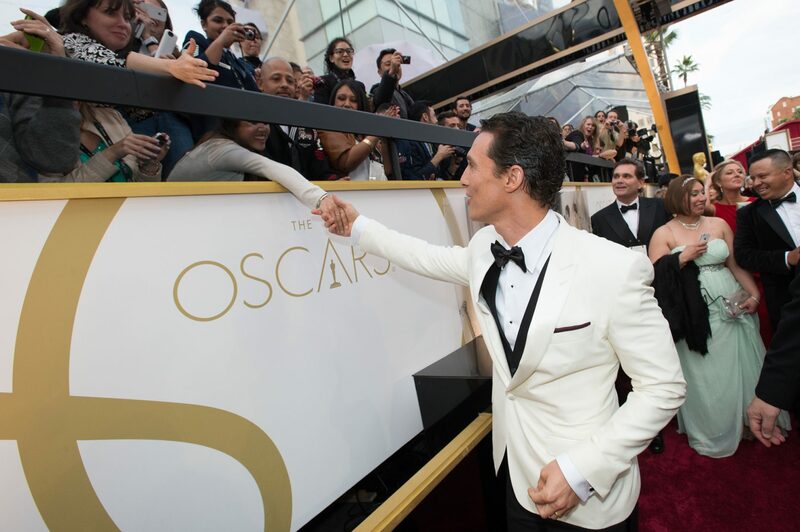 Oscar® Nominee for Best Actor in a Leading Role for his work on “Dallas Buyers Club” Matthew McConaughey arrives for the live ABC Telecast of The 86th Oscars® at the Dolby® Theatre on March 2, 2014 in Hollywood, CA. The script told the true story of Ron Woodroof, an electrician, rodeo cowboy and homophobe, who in 1985 was diagnosed with AIDS and given 30 days to live. Frustrated by the lack of available medicines in the US he scoured the globe for alternative remedies. Upon returning to Dallas he set up a buyers club to supply people with AIDS and HIV medications which were not government- approved and in the process became a gay rights crusader. It was the role of lifetime for the Uvalde, Texas-born thespian and one which saw him shed close to 20kg to properly portray Woodruff. As pictures emerged from the set of the film of the bony, thin McConaughey, talk began to circulate of his drastic transformation. It wasn’t until the film was released that the dialogue shifted to the leading man’s performance. the fact it was completed was a minor miracle according to McConaughey. But when he got sent a first look he knew something special had been captured. Soon enough it and its cast was being bestowed with nominations and awards for some of the most renowned honours in the biz. Matthew McConaughey accepts the Oscar® for Performance by an actor in a Leading role for his work in “Dallas Buyers Club” during the live ABC Telecast of The Oscars® from the Dolby® Theatre in Hollywood, CA Sunday, March 2, 2014. The audience errupts into applause and cheers while the man of the hour looks toward the ceiling. This is the culmination of years of dedication to chasing something people would have never thought he could get and he understands that. This victory is sweet. He collects the prized statue with the audience now on its feet, a sign they are undoubtedly aware of the transformation this man has undergone, not just for this role but for his career. 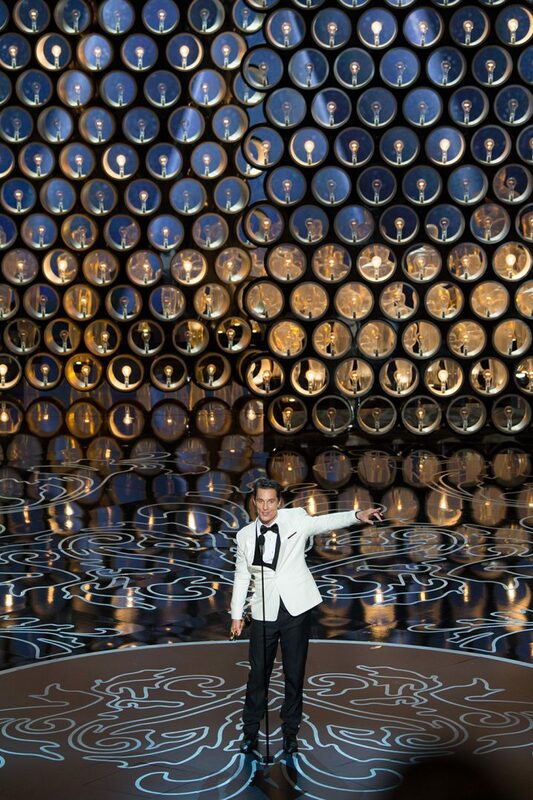 His acceptance speech is delivered with that signature McConaughey charm but it’s a much more self-aware tone. He tells the audience there are three things he needs each day: something to look up to, something to look forward to and someone to chase, with those being God, his family and himself in 10 years. On the latter he admits he will never become that person 10 years in the future because they will always be 10 years away and that’s just fine by him because that keeps him chasing. As his moment of recognition draws to a close, McConaughey shows he is mindful of his own journey by ending his speech with two of his most famous lines of dialogue from his first film, Dazed and Confused. Just as those were a symbol of his arrival on the scene when they were first said, now they are announcing another arrival – that of a man who is only just getting started. Again.